World of Warcraft announced last week,that Arena and Rated Battlegrounds Warlords Season 2 will be ending soon. When they announce this, it´s 2-3 weeks left until the next patch comes out. 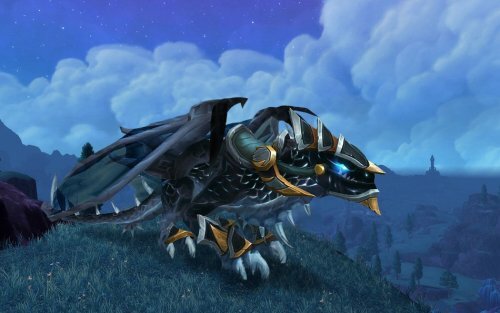 Players will now have a chance to loot a rare Infinite Timereaver mount from any Timewalking boss. This will be introduced in 6.2.3 because blizzard want to give the players the opportunity to fill up their raids easier by inviting frends/pugs to fill up the missing slots so they can do Mythic Raiding. For Valor points, players can upgrade the item lvl (ilvl) on their gear 2 times (5 + 5 ivlv). 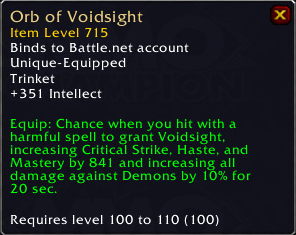 You will be able to upgrade your ilvl with valor points by talking to the NPC next to the transmog and void storage NPCs. Players that kill Archimonde on Heroic or Mythic difficulty will be rewarded with a quest that leads to the awesome Groove Warden Mount as quest reward. 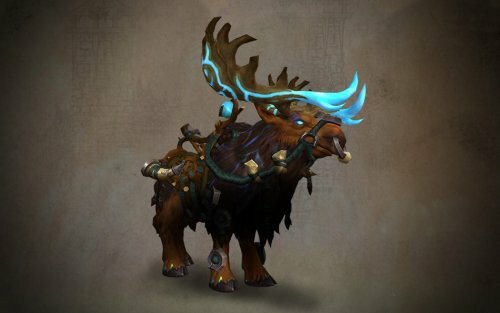 The time Limit to achieve this mount will be from the start of patch 6.2.3 until “some time” before Legion´s launch. 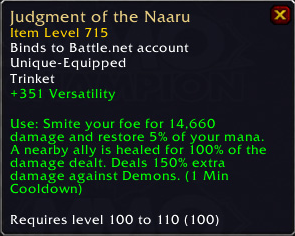 There will be a chance on getting items with item level up to 725 when doing Mythic Dungeons. 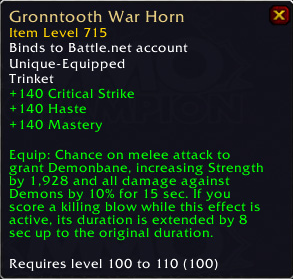 Players in Mythic Dungeons will also now have a chance to loot a new Heirloom Trinket that will scale to level 110. 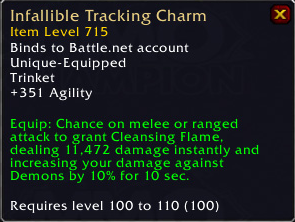 Notice the ilvl (715) at lvl 100. 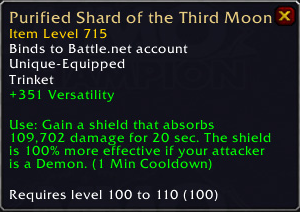 The Baleful gear will now have a chance to become 695 directly, so you don’t need to buy the upgrade for 20 000 Apexis Crystals. The Warlords Arena Season 2 will come to an end and transition to season 3. In the next patch (6.2.3), Blizzard will introduce the Valor point System again. For the players that haven’t any idea of what Valor is, well, think of it as a currency to buy stuff for. Like any other currency in the game, but of course, you earn them in another way and use them on something else. You use Valor points to upgrade your gear item level (gear from HFC, Baleful and crafting items), and you can upgrade them two times with 5 ilvl each time with a cost of 250 Valor points per time. In total you can earn 4875 Valor Points each week except when it´s pet battle event, then you will earn4375 Valor points instead, since the pet battle even is not included. The reason for that is because pet battling are account wide. If we look at the total Valor points needed for full gear upgrade and the total amount of Valor earned per week, we can clearly say that you need 2 weeks to upgrade all you gear (if you do everything to get max Valor point each week).